Dubai is known for its innovation, creative spirit and numerous attempts to set – almost always successfully – new world records – so it’s no surprise the destination has introduced some more attention-drawing attractions this summer. Here are some of the highlights. Earlier this year a Dubai food truck introduced the world’s most expensive burger with gold leaf. Now, one of the destination’s top restaurants, Pierchic, has launched a posh version of fish and chips – the classic British dish most commonly served in newspaper with a splash of vinegar and sprinkling of salt. Pierchic’s upmarket version uses a more upmarket fish – turbot – instead of the traditional cod or haddock, and when accompanied by chips made from Maris Piper potatoes, the dish will set you back AED 270 (US$74). Turbot is commonly found in European waters and considered a delicacy while Maris Piper potatoes are deemed Britain’s favourite and have a dry matter content, which makes them ideal for chunky chips. Batter and fry it all up and Pierchic has the posh fish and chip market cornered. The restaurant is located at Al Qasr, Madinat Jumeirah. Continuing on a similar theme, Dubai’s Broadway Bakery recently produced one of the world’s most expensive cakes to celebrate India’s Independence Day (August 15). The cake featured popular Bollywood actor Aamir Khan in character as the wrestler and coach Mahavir Singh Phogat from the 2016 hit movie Dangal. Local media outlets reported that Broadway Bakery's team of six cake artists and its head chef spent nearly four weeks creating the cake and acccording to Broadway Bakery's Facebook page, “the client wanted gold to be generously incorporated into the cake” – a request fulfilled by coating each medal that featured on the creation with 75grams of edible gold. Broadway Bakery made the headlines earlier this year after it created a ‘Game of Thrones’ edible-gold encrusted cake that included a sculpture of lead character Tyrion Lannister on throne. The bakery is located at Emirates Towers in Dubai. Construction of Ain Dubai – the largest and tallest observation wheel in the world – is now 50 percent complete. Developer Meraas recently confirmed the installation of the fifth of eight 107-metre sections of its wheel rim, which is one of the attraction’s most striking features. The new landmark is being assembled on Bluewaters Island, an offshore development close to Jumeirah Beach Residence that is being pitched as one of Dubai’s newest and most exciting tourism destinations. Once completed, Ain Dubai will become an icon, offering stunning 360-degree views of the city and its coastline. 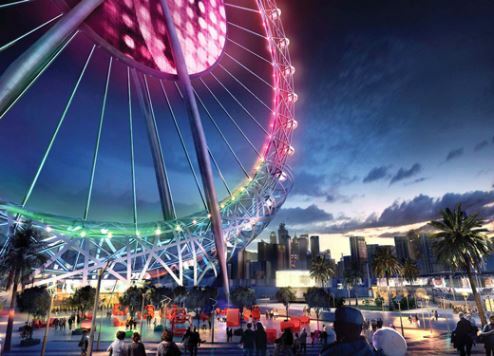 At more than 210 metres tall, the wheel will eclipse the 167-metre High Roller in Las Vegas and the 190-metre New York Wheel planned for Staten Island. The hub and spindle at Ain Dubai were installed in 2016 and the final structure will include around 9,000 tonnes of steel, almost 25 percent more than the amount of iron used to construct the iconic Eiffel Tower in Paris. Work will soon get underway on one of Dubai’s future landmarks, the UAE Pavilion – a focal point at the upcoming Expo 2020 Dubai, which kicks off in October 2020 and runs until April 2021. The 15,000-square-metre pavilion, located opposite the Expo site’s Al Wasl Plaza in the centre of the 4.38 square kilometre development, will house a range of exhibitions and is scheduled for completion in 2019. The pavilion’s sleek design has been modelled on the wings of a falcon, the UAE’s national bird, by Spanish architect Santiago Calatrava. In keeping with Dubai’s reputation as a global retail hub like no other, a brand new mall is being built in the city’s Silicon Oasis precinct that introduces more world-class architecture to the city. Expansive rooftop gardens, a sleek, modern design and several large green spaces have been incorporated into the design of The Avenues Mall. According to developer Lulu Group, the mall will feature more than 80,000 square metres of retail space, including an 8,940sqm hypermarket, a 7,600sqm department store, plus 34,593 sqm of retail shops and services including 13 restaurants and 25 food court kiosks. There are also plans for a 6,900sqm multi-screen cinema complex alongside a 2,300sqm bowling centre, a massive gymnasium and a 7,100sqm family entertainment centre. The mall is set to open in 2020.